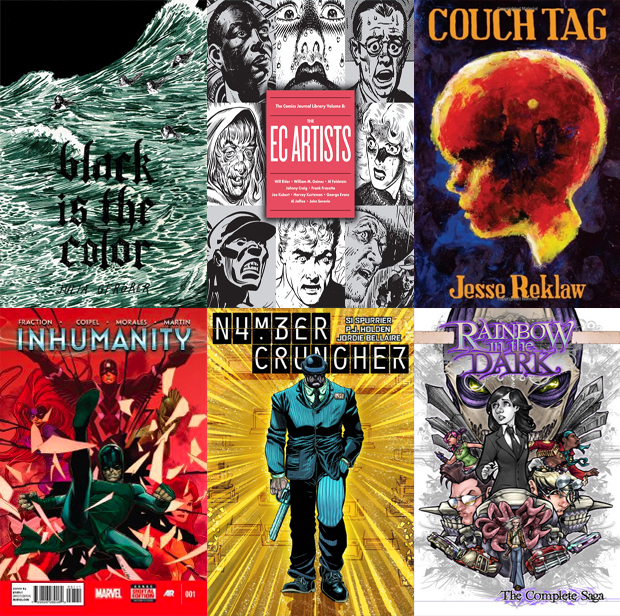 Three projects of note out this first week of December: Black is the Color by Julia Gfrorer, The Comics Journal Library Vol. 8: The EC Artists, and Couch Tag by Jesse Reklaw. I’m unfamiliar with the works of Gfrorer and Reklaw – a quick glance at the preview pages and their particular individual style and presentation of atmosphere was enough to stir interest. The EC Artists is the first of two volumes of interviews detailing the history of EC Comics and its many influential artists. Inhumanity is off to a rocky start. No way it’ll live up to the good marks Infinity has been receiving. Now there are delays, changes, etc. – which makes me think Marvel rushed this one out prematurely. Probably should’ve let Infinity reverberate throughout their line before jumping into this next event; From Titan Publishing, the Numbercruncher vol.1 HC. I’ve been meaning to give one of their new titles a chance. This one won out. ; and another nod to the now released Rainbow in the Dark: the Complete Saga by Comfort Love and Adam Withers.